Why do young people in our own Catholic secondary schools read Shakespeare in literature class, Homer in Latin class, and Einstein in physics class, but, far too often, superficial texts in religion? NOTE: Bishop Barron offered the following intervention at the Vatican during the 2018 Synod on Young People, the Faith, and Vocational Discernment. For more Synod content from Bishop Barron, visit WordFromRome.com, where you’ll find behind-the-scenes videos, interviews, commentaries, and more. I can find only goodness, truth, and beauty in what Bishop Barron has said. Bravo! “I realize that in some circles within the Church, the term apologetics is suspect, since it seems to indicate something rationalistic, aggressive, condescending.” What circles? The liberal circles that want to form a ring around the faith according to their own opinions and meanings; the circle of Pope Francis with its progressive word magicians? Perhaps before we run off doing apologetics we should begin by all agreeing that a “defense” of the faith is not a bad or necessarily aggressive thing. In the circles Bishop Barron speaks of, John the Baptist would have been considered a mean man full of “toxic masculinity”. Pope Francis himself once distinguished between humble sowers of the faith and “apologists for their own agendas”, thus equating an apologist with a sower of strife. This is the equivalent of saying “masculine for their own violence” and Voila! instantly “masculine” becomes a dirty word. St. Justin Martyr and Apologist, pray for us! Interesting perspective worthy of pondering Inigo. In favorable response to Bishop Baron’s points one, two and three…yes, yes, and yes. But then is there still something else? Back in the 1970s I posed a question to a reliable (!) Jesuit: “Why are so many priests leaving the priesthood? What doctrinal [or intellectual] difficulty trips them up?” His answer: “It has nothing to do with doctrine. It’s because they already stopped praying years before….three squares and a flop, that’s all.” For the laity, today, how much of the intellectual argument (Baron’s religion versus science) is likewise a facade? Still, “yes” to a better apologetic (and Bishop Baron has already shown much on how to do this). Impregnated (in more ways than one) by the “secular influence,” do the un-catechized and de-catechized young still ask about such things? Especially when some of the clergy, even at the Youth Synod, seem themselves to be paradigm-shifting away from notions of traditional marriage and family and objective right and wrong? Unlike Christ on the Road to Emmaus, when St. Peter accompanied pre-Christians–who were NOT yet disciples–it sometimes went something like this: “With many other words he warned them; and he pleaded with them, ‘Save yourselves from this perverse generation’” (Acts 2:40). What then, today, in our not-pre-Christian, but post- and anti-Christian culture—an even lower starting point? As part of our New Evangelization, what would deprogramming look like? In addition to how apologetics can be done better, what else has to be purged, maybe even with some fraternal tough love among the Synod fathers? We are waiting for Latin bishops to fix liturgical praxis and restore ad orientem worship. Bishop Barron – with the utmost of respect, the Mass is the preeminent catechisis. Lex orandi, lex credendi. Give young people the ancient Mass of all Ages, give them the Holy Sacrifice of the Mass. No Word of Judgement there. Today’s youth – and adults for that matter – are ill-formed in critical reasoning, being relativists where truth can contradict truth; they constantly use faulty logic, laden with errors and logical fallacies. The assertion that intellectual reasons are the reasons for leaving the Bosom of Holy Mother Church falls away under any scrutiny. When asked to explain leaving the Catholic Church, the vast majority of lapsing Catholics leave for emotional reasons. You can see the converse in such sources as The Coming Home Network, where over and over, deeply intellectual (and often highly educated) Protestants, non-Christians, and Atheists convert to the One True Faith. Catholic Truth is intellectually unassailable, actually. OK fine. Begin with our beautiful, timeless liturgy. Have the guts to face the Tabernacle of God when saying the Holy Mass. Too much to ask? OK fine. Say goodby to even more of the young. No problem. “The Lord walks with the couple”, They are two men walking down a road – – they are NOT a couple. Is this just a slip or do we see a Bishop who longs to be a Cardinal? That scared me the other day too. The scripture does not say two men. It says two disciples. We know the name of one: “Cleopas.” The other remains unnamed. Yet, Cleopas seems to be going home. The only other mention of this name in scripture is at the Cross (JN 19:25) Mary the wife of “Clopas”. “Clopas” is a variant spelling of “Cleopas.” If he is going home, would he not be going there with his wife? Is his wife who stood at the foot of the Cross of our Lord, not a Disciple? IF you read the passage again with a married couple in mind, there are great theological implications for the sacrament of matrimony. It also makes sense because John begins the public ministry of Jesus with a wedding at Cana; it would only make sense that he would end it with a marriage, one consummated in the Holy Eucharist! My teenage children all agree, with my wife and I, that their required “confirmation classes” are a pathetic, dumbed down, wishy-washy waste of time. My wife has “assisted” as a teacher in the class for 2 years: she said the basic program is junk. The deacon in charge last year threw out the diocesan/parish program and gave the teens something challenging and adult to deal with. My wife is yet again re-fighting the same battle this year, to replace the awful, fabricated junk program. The Catholic Church has a culture: Jewish roots, and an Apostolic tradition from Jerusalem, wedded to Greek philosophy and Roman Law. And all of the liturgy, art, music and architecture that flowed and flowered from this for 2000 years. The alternative “non-culture” of the contemporary Church, “invented” in the 1970s, is a barren wasteland. When are Latin bishops going to restore the traditional order if not the traditional age for the reception of the sacraments of initiation? 50 years after Vatican 2 and many are still witholding Confirmation until teenage years. Chris, I fully agree. For many years now I have questioned just how well graduates from my city’s Catholic high Schools know their faith. More to the point, I question if they even know what it means to be Catholic. I am a product of the arguably top (Jesuit) high school where I live. The college- prep was exceptional. The Catholic-prep worthless. I am 57 and many of my generation practice no faith because in the 1970’s we were not taught the Faith. The Baltimore Catechism (eradicated before my time) was replaced with the uninspiring “Gentle Jesus come and squeeze us” and “Why is the grass green? The grass is green because Jesus loves us.” That is NOT teaching the Faith. Bishops: Give the youth the Extraordinary Form of the mass. Take away priest-centric mass. Give youth the Mozart mass and do away with guitars and saxophones. Give youth doctrinally true and hard-hitting homilies and stop with the soft sell regarding matters of mortal sin. Give them Truth. Give them a Catholic identity. They won’t break. They will embrace. 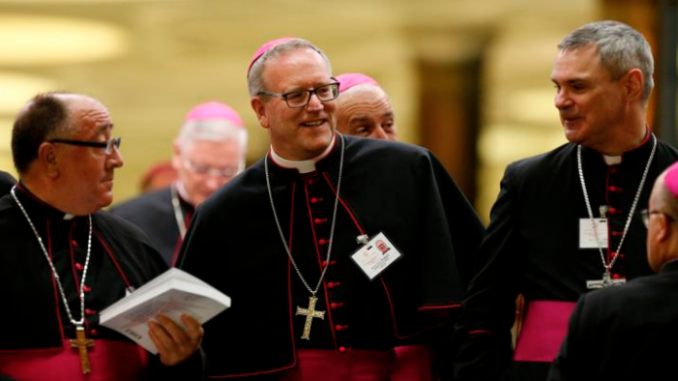 His Grace Bishop Barron should perhaps take over from Cupich in Chicago. He would be a much better sheperd. “… the couple” Yes, i found that strange. It is weird to here new words being used with scripture that i have never heard used before. I heard a homily and the priest spoke about how God made people for one another and he never said that God made men and women for one another. Strange. While you make a point of “how” Jesus accompanied these two to teach them you neglect to address the fact that many priests, bishops, cardinals don’t walk with anyone. They are too busy being administrators or “buddies” or whatever they are doing leaving their responsibilities to the laity. You mention talking about using saints as an example but how many priests today will even tell anyone that becoming a saint and being holy is our goal and purpose? Maybe 1 out of 100? 1 out of 1000? The problem is too often the faith is given with no point, no purpose, and the relative equivalency that everyone is good, it doesn’t matter how you live, we’re all going to heaven anyway. Why would anyone follow that? Also, a point is not made to correct those in error but rather let their errors be multiplied. Where are the St. Thomas Beckett’s to tell politicians and rulers when they proclaim to be Catholic but their beliefs and actions and policies they support run opposite to the faith and are mortal sins such as abortion? If our “alter Christus” actually pointed people to Christ perhaps people would be led to Him and stay in the faith. Instead too many of our “alter Christus” are leading souls to hell. BINGO. But might I say that the usual practice of nodding in agreement when someone has these objections (i.e. Adam and Eve are not literal, the flood is a myth, God didn’t really command a ban it was just a primitive misunderstanding, etc), isn’t helping and only leads to more nonsense and more doubt. So frequently these explainations are invoked without any rational basis (how do you know? ), without any development of the rational consequences of such a statements, without any respect for the long held teachings of the church, the inerrancy of scripture, the inspiration of the scriptures, etc. That the world holds the view that our religion is unbelievable isn’t that surprising, but that doesn’t mean it’s not true. You are correct and Barron himself skirts Luke 13:24 by affirming the hope for an empty hell idea. We need teaching about sin, repentance, and salvation, to put a fine point on things. The world is on fire but numbed by material progressivism. And the Church wants to what, figure out how to reach it thru some sort of Nike ad campaign pasted together by Vatican Mad Men? As a graphic designer I was enamored of such dreams myself 20 years ago. I still think delivery methods matter, but not nearly so much as message content. Leaders pontificate about reaching youth while they cannot even keep a house clean from homosexualism and clericalism. I like Barron, but I tend to agree with the voices that called for cancelling this whole Synod. The best witness would be leaders leading like morally responsible adults and not politicos or bureaucrats. Live the faith, teach the faith, and let God worry about results. The problem for the Church today is not reaching youth, but reaching anyone while it stands idly by watching so much moral and doctrinal corruption. There is plenty of beauty already in the world today, but no quite as much unafraid witness to moral goodness and truth. I guess I sound like a rigorist. I’ll go read Pascal! Is reading Homer in Latin class an American thing?? Here’s part of the rest of the story, coming from one who had a direct role on the aircraft carrier USS Hornet that in the Pacific recovered the first astronauts to leave footprints on the moon (Apollo XI, July 1969). The Commanding Officer was a devout Catholic all his life and regularly attended Mass with members of his crew in the ship’s chapel(Radm. Carl Seiberlich, RIP, Arlington National Cemetery, July 2006). Seiberlich sent a piece of memorabilia to Pope Paul VI, and a month later–under a night sky overflowing with a million visible stars, and from a Church not yet so veiled in shadows–the chaplain read over the intercom the appreciative papal blessing upon all 2,500 members of the ship’s crew, Catholics, Protestants, Jews and undecided. Matthean Priority restores papal primacy, but it is our Hebraists who can now restore Gospel credibility. Thanks largely to study of the Dead Sea Scrolls, at least 20 have concluded that at least the canonical Greek Gospels of Matthew and Mark are TRANSLATIONS of earlier Hebrew or Aramaic texts, probably written by those evangelists. (J. Carmignac, “The Birth of the Synoptic Gospels”) May those studies soon displace faith-undermining Markan Priority in our universities and seminaries and thus reestablish a rock-solid foundation for apologetics!